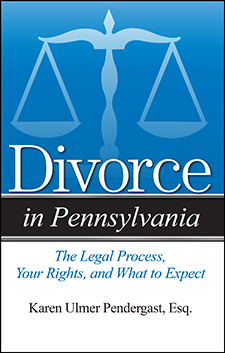 Are You Getting a Divorce in Pennsylvania? If you are considering divorce, you will need all the accurate, objective information you can get to help you make the right decisions for your future. But gathering essential facts about property settlement, division of debt, child custody and support, and so many other pressing subjects can be a time-consuming and frustrating experience. Attorney Karen Ulmer Pendergast understands your needs. During her years of practicing family law, she has helped hundreds of individuals navigate the maze of divorce. In Divorce in Pennsylvania she answers not only the questions on your mind but also those you may not have thought to ask. How long does it take to get a divorce in Pennsylvania? Does it matter if my spouse had an affair?